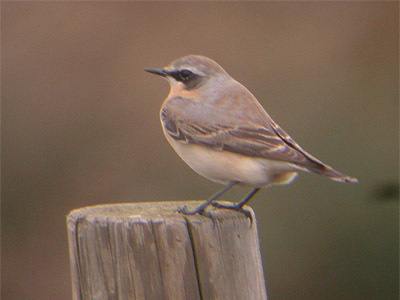 Spring 2006 will be best remembered for producing a record number of Wheatears. A total of 30 birds in April, easily beat all yearly counts between 1998 and 2005. Visible migration however, was again relatively uneventful and the only notable daily counts were 104 Meadow Pipits north-west April 16th, 96 Meadow Pipit and 78 Swallow north-east April 22nd. A total of 391 Meadow Pipit were recorded in April - the best monthly count of any migrant, with both daily and monthly totals again poor this year. Observer coverage (or rather lack of it) can be partially attributed to such poor counts. As in 2005, high counts on seemingly ideal mornings again failed to materialise. 689 Fieldfare with 350 Starling at Tug Bridge Farm on March 16th, was a decent count as numbers built up prior to return migration. Summer migrants that failed to arrive in March and subsequently produced latest-ever arrival dates in April and May were Chiffchaff on April 5th and Willow Warbler on 15th, Turtle Dove (May 11th) and Cuckoo at Eakring Meadows (4th) The Spotted Flycatcher at Eakring Flash on the May 8th, was the earliest by two days. Similarly both Sedge Warbler and Grasshopper Warbler also returned on site in record time this year. An unprecedented arrival of three Grasshopper Warblers at Eakring Flash on April 16th, were then followed by others on April 17-27th, 19th, 22-30th, 24th and 26th. A male Whinchat arrived at Penny Pasture Common on May 12th (latest ever arrival date) with a female there next day. Whinchat continues to be a very difficult Spring bird here now, as they have become increasingly scarce over the past few years. The dates of these two birds fits in well with previous records which show two distinct (and short) arrival periods from April 22-27th and May 11-14th. Reed Warblers returned to Eakring Flash between 6th and 23rd. A significant event throughout much of April was the notable passage of Wheatears through the Eakring area and presumably across much of the county as a whole. Included within the final April total of 30 indivduals, were at least three Greenland Wheatears (Oenanthe oenanthe leuchorhoa) which were photographically identified by checking primary projection (Greenlands have six visible primaries) but there were probably more within the month's total which made it the most significant northerly Wheatear passage in nine years coverage. April 28th 0 . .
April 30th 0 . . Confirmed records of Greenland birds were a pair at Eakring Meadows from April 17-19th, with the male male remaining till 20th. Another male was present at Tug Bridge Farm for two days on 26th and 27th in company with birds of the nominate race, where the physical differences between the two were easily observed. On the basis of size alone, this bird stood out from the others at distance and race identity was eventually confirmed upon closer viewing. Typically, the majority of Wheatear records came from bare fields at Tug Brdge Farm and Church Hill, with few sightings coming away from these sites. Previously favoured stop-over sites such as the new paddocks on the edge of Eakring village, were ignored this year. The first of the Spring was a female in fields at Stonish Hill near Eakring village on 9th, followed by a male at Tug Bridge Farm and a female at Church Hill (both on 15th) the day that marked the start of daily passage that continued until April 27th. Between April 16th and 23rd, the total number of birds in the area never fell lower than four and the highest count of eight was on April 22nd and 23rd. April produced an excellent site list of common waders, although some species are rare in occaurrences here. Single Little Ringed Plover flew over Eakring Flash (6th) south-west over Penny Pasture Common (22nd) and high north over Eakring Flash on 28th. Three birds in a single month being the first such number for many years here. Small numbers of Golden Plover flew over Eakring Flash on a couple of dates, but a flock of 66 flew high west on a wet 22nd. Rarer waders seen this Spring included a brief Redshank at Penny Pasture Common on 18th, two Curlew low south-west over Eakring Flash on 22nd and a Common Sandpiper at Eakring Flash on the 17th. this bird caused quite a stir towards the end of the year, when it was thought by many on initial reaction, to be a possible Spotted Sandpiper. It was eventually deemed to be a Common by the experts. A single Jack Snipe was still at Eakring Meadows (2nd) and was the latest-ever Spring record for the area, whilst up to 20 Common Snipe remained at the same site until April 3rd at least. An adult Peregrine drifted north over Red Hill early morning of the March 8th and the year's second Merlin flew over the road at Eakring Meadows and headed in the direction of Eakring Field Farm (March 6th) The first Hobby were two moving east over Church Hill on April 29th, which were also seen on later dates. A very late Short-eared Owl was at Eakring Flash during the afternoon of May 7th, whilst a male Common Crossbill east over Eakring Flash on March 19th and five Arctic Terns north over Eakring Flash (April 28th) were other scarce records. Migration was noticably better than it had been for several Autumns. Even with rather inconsistant coverage, some good counts were reached over the period and there were records of some scarce migrants too. 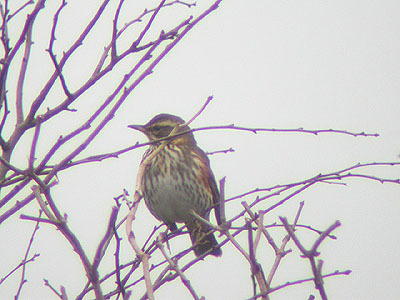 A record Redwing passage took place at the end of the October. After 218 had gone west on the 11th, a huge movement occurred on October 26th with a record total of 4 540 moving mostly low south-west, but with some flocks also heading south in what were (for most of the time) extremely windy conditions. They were conditions which do not usually provide such numbers, but Redwings and a few Fieldfares poured through. After only half an hour's observations, the total had reached over 1 500 Redwing and with most flocks containing over 100+ birds, the count rose quickly. Coming so soon after late October's record Redwing movement, 5 275 Fieldfare flew west and south-west on November 2nd, with two clear waves of birds that appeared to be moving on a broad front. Unlike the very windy conditions which the Redwing braved, migrating Fieldfare had perfect weather, with blue sky and light winds. After just over an hour, the count had reached 1 000, but a massive increase in birds between 08:25h and 08:35h produced a count of just over 1 300. Fieldfare were still going through during the following hour, but the numbers dropped over that time, before another wave of birds began pouring through low. The period 09:45h-10:30h produced another 1 747 Fieldfare and the final total of 5 275 was the largest I have seen in nearly ten years visible migration watching. Experience gained over that time, suggests that a morning total exceeding 2 000 birds is something exceptional in Nottinghamshire. It was quite a good Autumn for Brambling, starting with a single frequenting the old hedge and set-aside fields west of Eakring Flash on October 14th and despite remaining all month, remained virtually impossible to see. Two singles went south-west and east over Eakring Flash on October 26th before a flock of 13 went west (November 2nd) and an elusive single was in the Eakring Flash area on the 4th. Other peak species counts included 102 Meadow Pipit south on October 11th, whilst October 8th saw 33 Yellowhammer south-west (a total that beat all other single day counts) 130 Linnet 40 Greenfinch and 44 Chaffinch move through. Migrant Starling produced some fair movements on three dates with 514 west on October 11th, 1 201 west (November 2nd) which was followed by 1 340 west on November 4th. Visible migration had gained momentum earlier in the Autumn during August, with House Martins peaking at 249 south-west and Swallow (66) south and south-west on the 24th. 143 House Martin also went south-west on the 31st. Although there were no Meadow Pipits noted at all during August, two rare Tree Pipit records were the single which flew south-west over Penny Pasture Common on 16th and two present at Eakring Flash for ten minutes, before they flew off north-east on 27th. Two other scarce migrants arrived in August, with a male Redstart at Penny Pasture Common and a Whinchat at Eakring Flash (both 24th) Rarest bird was the Wood Lark that flew over Red Hill on September 26th. August also saw Willow Warblers and Whitethroats moving through the area, with both species peaking around mid-month. As the number of Willow Warbler declined, so numbers of Chiffchaff increased. The seven at Eakring Flash on August 31st representing a distinct fall/arrival. Some last dates for Summer migrants were Spotted Flycatcher on September 9th, Penny Pasture Common; Yellow Wagtail at Eakring Field Farm September 24th; Lesser Whitethroat and Whitethroat at Eakring Flash September 10th and Blackcap at Eakring Flash 28th. Late hirundines included a single Swallow and three House Martin south on October 11th. Green Sandpipers were seen on July 28th, August 3rd and August 16th. Whimbrel went through on July 20th and August 12th and Curlew sightings included three west on July 20th, with one in stubble fields at Eakring Field Farm on the August 19th. A Greenshank briefly at Eakring Flash September 10th was the first since 2004 and slightly rarer was the Dunlin north-east over Penny Pasture Common on November 2nd. An unusual passage of Lapwing occurred between October 5th and 8th, which involved 147 birds going west on three dates. Lapwing are rarely recorded moving purposefully here unless there is snow on the ground.